This 30 day self drive tour “Cape Town to Victoria Falls” – a classic tour in Southern Africa. However in comparison to the many guided tours that are available, this self drive tour allows you enough time to really enjoy all the nice places. The tour starts off in one of the nicest cities in the world, Cape Town. Alongside South Africa’s West Coast you make your way to Namibia. Via the Orange River and the Fish River Canyon you travel to the massive dunes of Sossuvlei before you continue to Swakopmund, the German city of Namibia. Via Twyfelfontein you drive to the Etosha National Park where you are able to see the numerous animals that call Northern Namibia their home. You then continue through the Caprivi and cross over to Botswana where you are able to see the numerous herds of elephants in the Chobe National Park. After a short stopover at the Victoria Falls you drive via Nata and past the large saltpans of Makgadigadi to the Okavango Delta. During a two day fly-in safari you can enjoy the beautiful views of the biggest inland delta in Africa. The tour then takes you via the Khama Rhino Sanctuary, a nature reserve for rhinos, to the border of South Africa and then to Johannesburg where your tour ends. Cape Town: Table Mountain, Lion’s Head, V&A Waterfront, Blouberg beach, Simon´s Town, Cape of Good Hope, Robben Island, Camps Bay, Kirstenbosch Botanical Garden (all optional). After your arrival at Cape Town International Airport you pick up your rental car and make your way to your accommodation, the Entabeni Guesthouse. You can then relax after your overnight flight, take a stroll on the beaches of Clifton and Camps Bay or go to town. You will overnight at the Entabeni Guesthouse. Many visitors agree on one thing: Cape Town is one of the most beautiful cities in the world and it is often compared to San Francisco. The unique flair with the ever-present Table Mountain in the background, the beautiful beaches and the impressive landscapes fascinate every single visitor. The sights are plentiful in Cape Town and each is as appealing as the next. It almost becomes a task as what to see first.... Table Mountain, Lion’s Head, Kirstenbosch Botanical Garden, the beaches in Blouberg or Camps Bay, the Cape of Goodhope, Simons’s Town, Robben Island or, or, or…. If that is not enough a daytrip to the Winelands is also recommended. You will spend two more nights at the Entabeni Guesthouse. Today you leave Cape Town and drive in a northerly direction to Vredendal. After you have travelled over the Piekenierskloof Pass and the first mountain ranges of the Cederberg, you reach the valley of the Olifants River. There used to be a lot of elephants in this area however nowadays it is one of the largest fruit production areas. On the way you can stopover in Clanwilliam - one of the oldest towns in South Africa and where rooibos is grown. Rooibos is used to make tea which is exported all over the world. You will overnight at the Melkboomsdrift Guesthouse, situated on a family wine farm close to Vredendal. While enjoying a leisurely breakfast you can once more take in the beautiful views of the grapevines before you continue your journey in direction of Namibia. On the way to the north you pass through the small town of Springbok which is surrounded by high granite rocks. At Vioolsdrift you cross the border to Namibia and shortly thereafter you will reach the Nortoshama River Resort which is perfectly situated on the banks of the Orange River. Here you can either relax on the riverbank or go canoeing on the Orange River. You will spend two nights at the Norotshama River Resort in ChaletsBungalows. Today’s journey takes you along the Fish River Canyon Park to the Fish River Canyon itself, which is the second largest canyon in the world with steep escarpments dropping down 550 metres. On the way to the canyon you can stop at the warm springs of Ai-Ais before you continue to the lookout point on the canyon rim. Thereafter you will drive on to the Canyon Roadhouse where you check-in for your overnight stay. In order to see the sunset over the canyon, you return to the lookout point. The impressive Tiras Mountain Range dominates the landscape on today’s route. Your destination is the Namtib Biosphere Reserve, a typical Namibian farm. Sheep are bred here and you can accompany the farm owner on his daily duties or explore the Tiras Mountains. You will overnight at the Namtib Desert Lodge and in the evening you will be served a typical farm style meal. You drive along the Namib Naukluft Park and the Namib Rand Nature Reserve to Sesriem, the gateway to the massive dunes of Sossusvlei, where we recommend that you stopover at the desert-rarity (Castle of Duwisib). You then make your way into the dunes where you will witness the astonishing play of light and shadow during sunset. You will overnight at the Desert Camp where you have the choice of either self-catering or should you wish to have breakfast and dinner, you can do so at the Sossusvlei Lodge (on request the accommodation can also be booked on a half-board basis). At sunrise the gates of the national park open and you make your way into Sossusvlei. You will park your vehicle and go into the dunes on foot. Alternatively you can also make use of a 4x4 transfer. You can hike one of the dunes; some reach a height of almost 300 metres. . From the top you will have an impressive view of the entire landscape. Thereafter you continue to the Sesriem Canyon where you can also hike in the dry season. If you want to learn more about the desert, you can book a guided desert walk at Sossusvlei Lodge. You will overnight at the Desert Camp. If you haven’t been to Cape Cross as yet, then you can still do this in the early morning before you make your way to Khorixas and travel over the Brandberg Mountain. With a height of 2580 metres it is Namibia’s highest mountain. You can stop along the way to visit the famous rock painting “White Lady”. On the way to your accommodation you can explore the Petrified Forest with its more than 200 million year old, mineralized tree trunks. It is also here where you will find the Welwitschia plants which can get up to an age of 1500 years and therefore also referred to as living fossils. You will overnight at Camp Kipwe which is in close proximity to the rock engravings of Twyfelfontein, the Organ Pipes, the Burnt Mountain and the Vingerklip. Today’s journey takes you to Outjo, where you can stop at a German bakery to buy some goodies before continuing to the Etosha National Park, you can visit the Ugab- Terraces and the Vingerklip. You will enter the Etosha National Park at the Anderson Gate. The national park was founded in 1907 and it is one of the most attractive national parks in Southern Africa. The Okaukuejo Rest Camp is the perfect starting point for game drives in the western and central part of the national park. In the coming days, you will spend most of your time game viewing around the waterholes where elephants, rhinos, giraffes and different species of antelope come to drink. 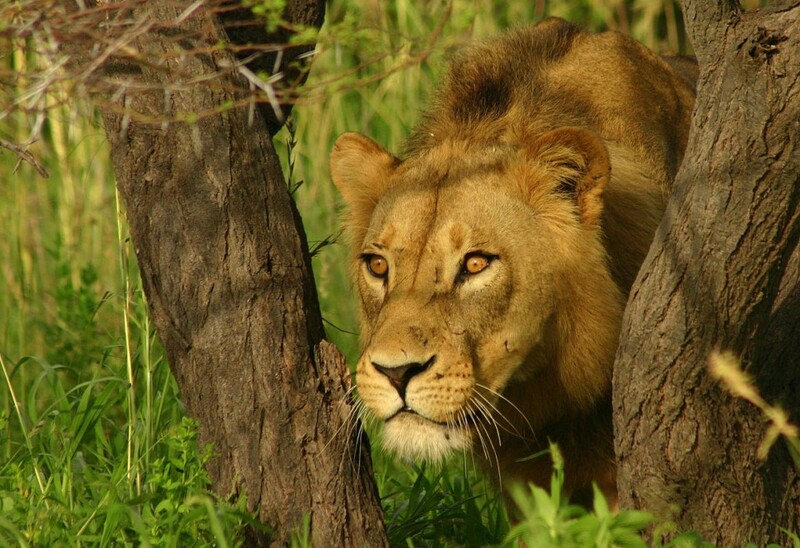 With a bit of luck you might even be able to spot lions and leopards. In order for you to experience the nocturnal wildlife you can opt to join a night game drive (optional and not included in the price). You will overnight at the Okaukuejo Rest Camp. 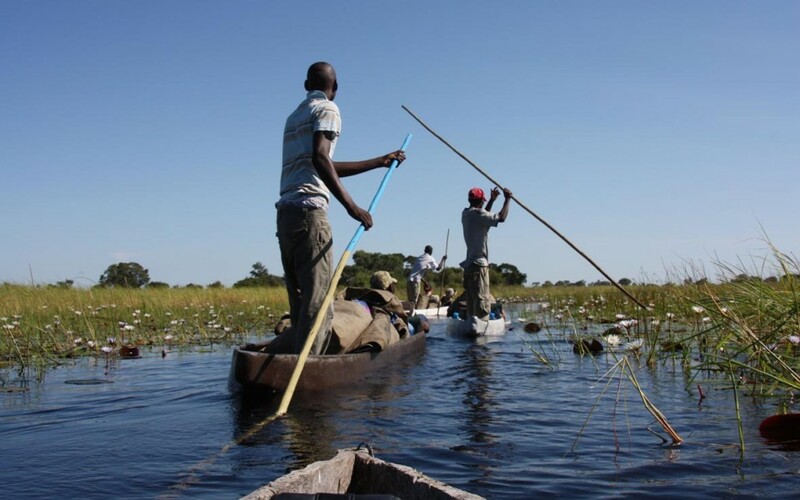 You continue your journey and travel through the eastern part of the Caprivi Strip. Your destination for today is the Kwando Camp which is situated on the banks of the Kwando River. 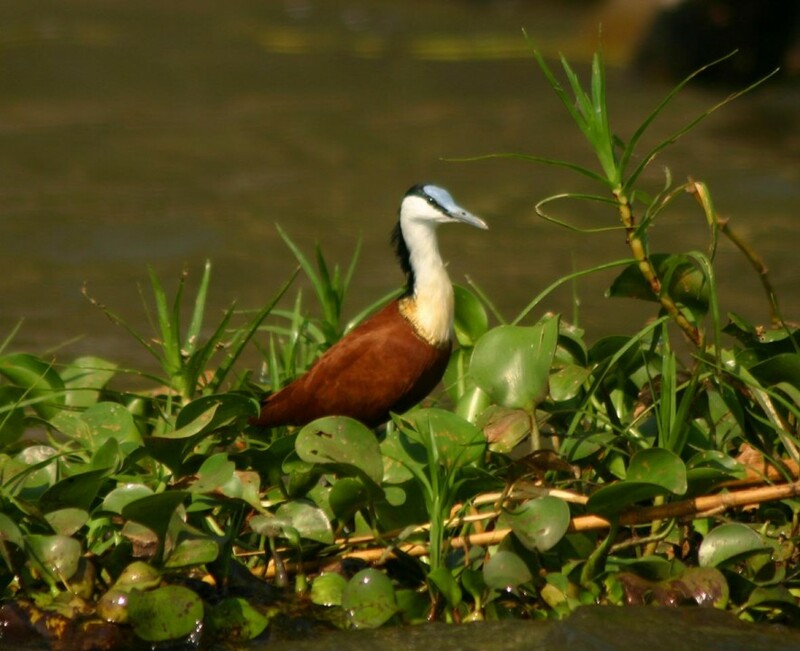 You can relax, go for a walk or take a boat trip to observe the diversity of birds. Furthermore you can also go game viewing in the Mudumo and Mamili National Park (only accessible with a 4x4 vehicle or on a guided tour). Once you have crossed the border into Botswana, you will check in at Chobe Bakwena Lodge. The Chobe Bakwena Lodge is situated on the banks of the Chobe River near the village of Kazangula and comprises of 10 rondavel style chalets under the surrounding Acacia trees. It is the ideal starting point for your activities in the Chobe National Park. With more than 40.000 elephants, the Chobe National Park is probably the park with the highest density of elephants in Africa. During the river cruise, you are most likely to see crocodiles, hippos, elephants, as well as other animals that come to the river to drink. On the game drive you will search for the large herds of elephants as well as all the other wildlife in the park. You will spend the night at Chobe Bakwena Lodge. After your morning game drive in the Chobe National Park you will be picked up at the Chobe Bakwena Lodge and transferred to Victoria Falls, while your rental car remains at the Chobe Bakwena Lodge. You will spend two nights at the Ilala Lodge close to the Victoria Falls. You will visit the Victoria Falls, also known as “Mosi oa Tunya”, which literally translated means the smoke that thunders. There are a number of activities available here and you are spoilt for choice. 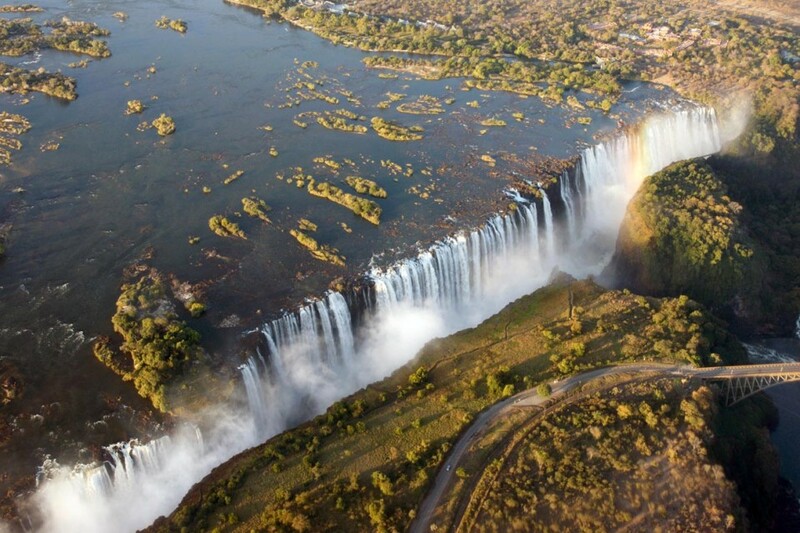 You can stroll along the Falls, do a sunset boat cruise on the Zambezi or fly over the Falls in a microlight plane. The more adventurous among you can go white water rafting or bungee jumping from the highest bridge in Africa. After breakfast you will be picked up at the Ilala Lodge and transferred back to the Chobe Bakwena Lodge in Botswana. In the afternoon you will join another boat cruise and watch the animals come to the river to drink. You will spend the night at Chobe Bakwena Lodge. Before you leave Chobe Bakwena, you will once again join a scheduled game drive into the national park and enjoy a hearty brunch. Afterwards you will drive to Nata. Your destination for today is Nata Lodge, the starting point for excursions to the Nata Bird Sanctuary, Sua and Ntwtwe Pans (all are only accessible with a 4x4 vehicle or on a guided tour). The pans consist of endless vast saltpans, wildlife rich grassland, mysterious “islands”, ancient baobabs and numerous well worth seeing sanctuaries. On a guided tour you can drive into the pans (the tours depart around lunchtime) and with some luck you will be able to see pelicans and flamingos. You will overnight at the Nata Lodge. After breakfast you make your way via Gweta to Maun and in the afternoon you can either relax at the lodge or stroll around the centre and the few shops that Maun has to offer. You will overnight at the Thamalakane River Lodge, situated directly on the banks of the Thamalakane River. Today you drive via Orapa and Lethakane to the Khama Rhino Sanctuary close to Serowe. The Khama Rhino Sanctuary is a project that was started in 1992 by the local community to help protect the endangered rhinos. Today the sanctuary is home to approximately 34 white rhinos and 2 black rhinos that you can observe while on game drives. You will overnight in chalets at the Khama Rhino Sanctuary. Breakfast and dinner can be obtained at the restaurant of the sanctuary. After breakfast you make your way to the Martin’s Drift border post where you enter South Africa and drive to Pretoria. The rest of the day is at leisure and you can either relax after the long journey or visit the city centre. Your last night in Southern Africa is spent at the Brooks Cottage in Pretoria. You drive to Johannesburg O.R Tambo Airport where you return your rental car. You will board the plane for your flight back home where you will arrive with a lot of new memories and experiences. 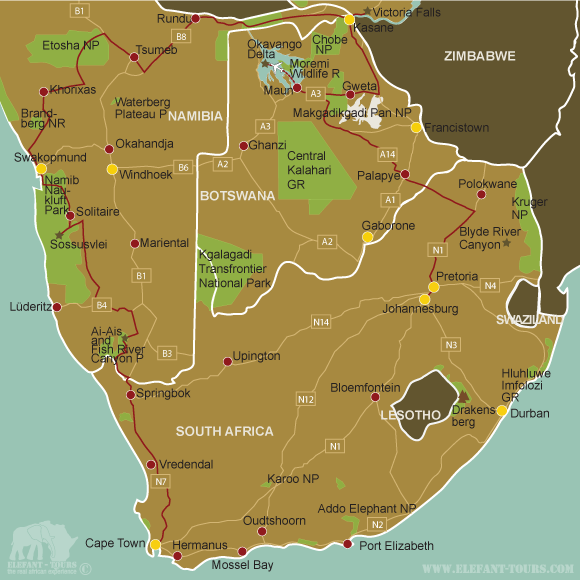 How safe is a self-drive tour in South Africa, Namibia& Botswana? 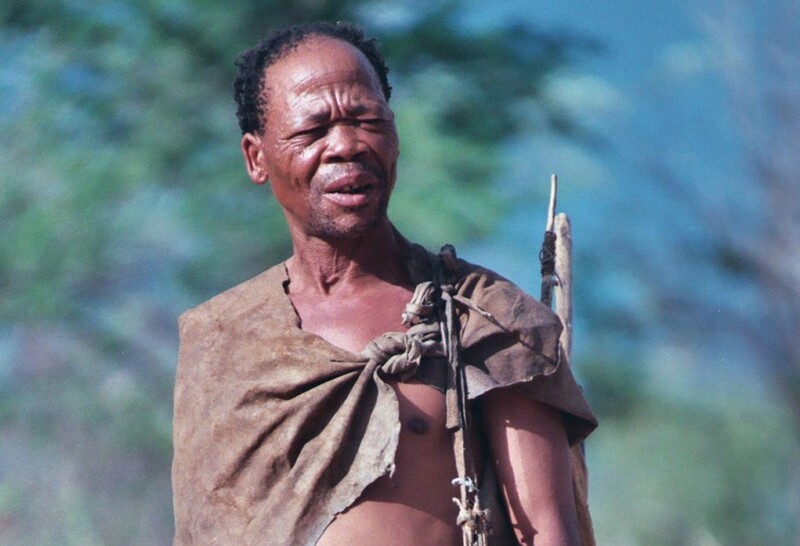 - In general South Africa, Namibia and Botswana are not a lot more dangerous than other countries in the world. Most crimes and acts of violence take place in the townships of bigger cities. Public areas around shopping centres, restaurants, banks etc. as well as the countrysideare very safe. Nevertheless you should stick to a couple of rules to avoid risky or dangerous situations. This includes staying away from dodgy areas, walking in the dark, carrying a lot of cash or expensive cameras on you, wearing flashy jewellery and leaving bags or valuables in the car. - Although Namibia and Botswana generally have a good infrastructure, the roads are not always in the best condition. Most of the roads are good gravel roads and only the highways and a couple of the main roads are tarred. In Botswana you will also have to look out for animals on or next to the road and we therefore urge you to drive with caution. In South Africa most of the roads are tarred and in good condition. It's only in the rural areas and national parks, where you will find gravel and dirt roads. - Petrol stations can be found alongside all major routes and highways as well as in cities and villages. - According to the law, all you need is a valid driver’s licence with a photo and which has been issued in English. If your national driver’s licence has not been issued in English or does not have a photo, you need an international driver’s licence. - As per the terms and conditions of the rental car companies, only a valid national driver’s licence and a credit card is required. 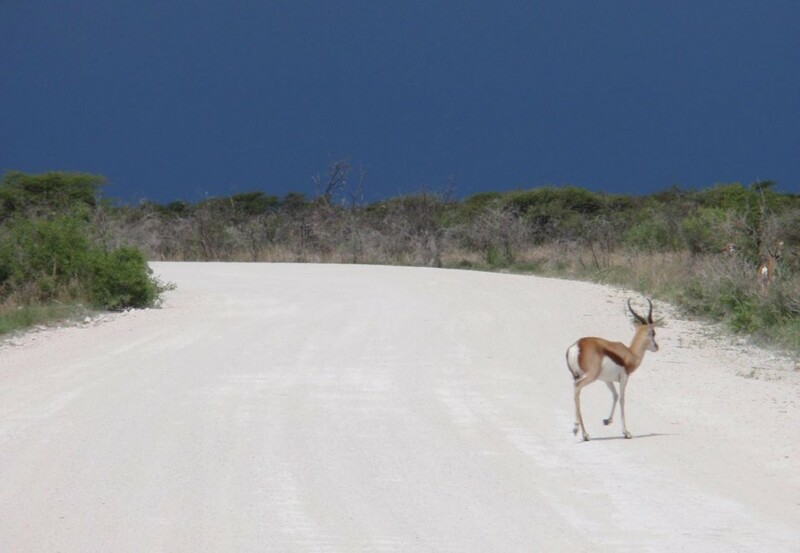 - In most of South Africa’s and Namibia’s national parks, the roads are tarred or good gravel and all are accessible to rental cars. Please however take note that you have to stick to the rules of the national parks at all time. These include: remaining in your vehicle unless you are in a designated area, sticking to the speed limit of 60 km/h on tar roadsand not littering. - At places where you can cater for yourself or you have a variety of restaurants to choose from dinner has been excluded. On days when it’s recommendable to dine at your accommodation dinner has been included. In these cases dinner usually consists of a set menu with local meat, vegetables and rice or potatoes dishes. - You can either exchange your own currency for South African Rand/Namibian Dollar/Botswana Pula at one of the exchange bureaus at the airport or in town or you can go to an ATM and draw South African Rand (in South Africa)/Namibian Dollar (in Namibia)/Botswana Pula (in Botswana) at the current rate of exchange. Please note that you need a credit card (VISA, MasterCard, American Express, Diners Club) and your pin code to draw money. At some ATMs you can even draw money with a Maestro Card. - Credit cards are also widely accepted in bigger shops in South Africa, Namibia and bigger towns in Botswana but as there are still some shops and petrol stations that do not accept credit cards, make sure you always have some cash on hand. - As northern Namibia, Botswana and Victoria Falls are situated within a malaria area, we would recommend some precautions. Please speak to your doctor or travel clinic about the different prophylaxis and their effects and side effects.